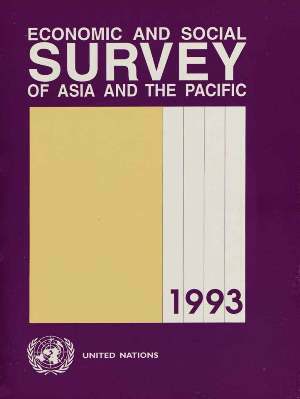 The Economic and Social Survey of Asia and the Pacific 1993 is the forty-seventh in the series of annual Surveys prepared by the secretariat. It provides information on recent economic and social developments in the region and analyses selected development issues. The Asian and Pacific region has once again distinguished itself by recording a high average growth rate in 1993 despite the lingering recession in the industrialized world and low growth in other developing regions. A particularly noteworthy feature is that a number of least developed countries have significantly improved their performance; however, the economies in transition in Central Asia continue to experience contraction in output. Economic growth in the region has been assisted by a variety of reforms in areas such as trade, investment, financial and fiscal policies implemented by Governments. Major recent reforms in these areas are highlighted in the context of the discussion on macroeconomic performance. Fiscal reform has been an important component of policy reforms. In most countries of the region, fiscal reform has achieved a substantial measure of success in augmenting government revenue, restraining the growth of expenditure, and reducing budgetary deficit. The incentive structure generated by reforms in tax bases and rates reflects the greater reliance on the private sector and more outward orientation of economies. At the same time, greater concern for the public provision of social services is evident from the changing patterns of allocation of expenditure. The region has undergone notable economic transformation resulting from sustained high rates of economic growth for many years. A rising share of manufacturing output in gross domestic product and rapid urbanization are but two manifestations of the transformation, which has not, however, been accompanied by a commensurate increase in the share of employment in manufacturing/urban sectors. This imbalance has been partly responsible for a number of social problems in the region. The progress achieved in social development with reference to selected issues such as poverty, employment, health and education is reviewed. The challenges that remain in these fields, as well as some emerging social problems such as crime and drug abuse, and their policy implications are highlighted. Finally, the Survey analyses the demographic change in respect of the rates of growth, age composition, and spatial distribution of population, and brings out their implications for education, health, employment and the environment. The emerging differentiated approaches to demographic issues in different countries, reflecting varying degrees of success in managing the transition in past years, are highlighted. As usual, the Survey is published on the responsibility of the ESCAP secretariat and the views expressed do not necessarily reflect those of member and associate member Governments.